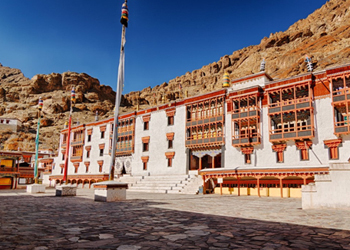 Hemis Monastery is popularly known as Hemis Gompa which is approximately 45 km from Leh. Hemis Monastery is the largest and richest Buddhist monastery in Ladakh which was built during the reign of King Sengge Namgyal in 1630. Visitors can see beautiful wall paintings in the veranda of this Gompa that depict the ‘Kalachakra’ and the ‘Lords of the Four Quarters’. There is also an idol of Sakyamuni Buddha at this monastery that attracts lot of devotees. For a more experiential visit, you can stay in the monastery guest house. Hemis Gompa plays host to a two days annual festival also called Hemis Tsechu that is held on the 10thday of the Tibetan lunar month and remembered as the birth of Padmasambhava, the founder of Tibetan Buddhism, is also a major tourist attraction. This monastery comes alive during the Hemis festival with all the vibrant colours everywhere. At the time of the festival, the locals get dressed-up in traditional clothes, where women wear vibrant headgears and loads of jewelery and men wear cummerbunds. The Lamas perform holy masked dance known as Chaam to glorify the victory of good over bad, while they are accompanied by long horns, musical drums and cymbals. The monastery has splendid murals and a museum which has stupas built of gold and silver and an impressive range of artifacts.